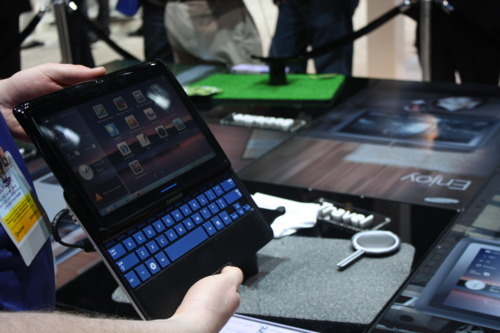 Convertible tablets certainly aren’t new, but the keyboard is typically on a swivel. In tablet mode, the devices don’t resemble iPads so much as closed laptops (see for instance the Lenovo ThinkPad X-Series, which has been around for a few years). Samsung’s new Sliding PC mimics the form factor of QWERTY-equipped slider phones: Closed, it’s a sleek-looking tablet; open, it’s a laptop with a decent-size keyboard. 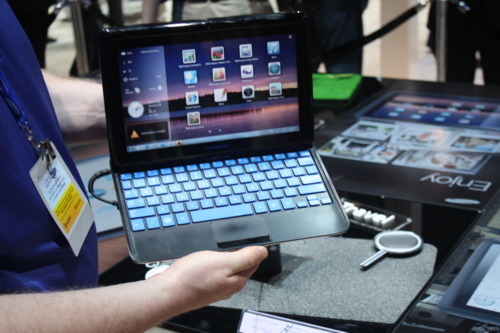 The Sliding PC runs Windows 7, weighs 2.2 pounds, and will be available in Q2. ← Real-Time-Shifted Content. I want it.